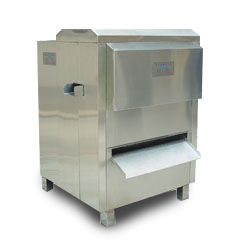 Litchi / Lichee / Lychee Peeling Machine can peel off skins of litchi (longan) without twig. 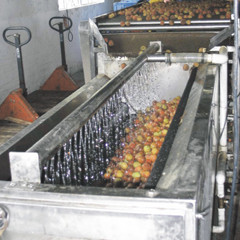 It is widely applied to process lychee juice, lychee wine, preserved fruits, dry pulp, canned food of litchi (longan). 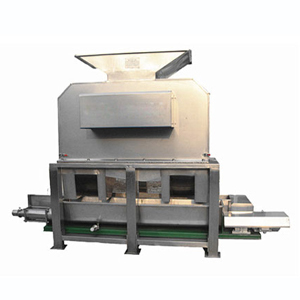 The SPL series Lychee Peeling Machine for Sale features compact structure and efficient working volume, low consumption of energy. What's more, the peeled lychee pulp is clean and loss of pulp is very small. Anyang Gemco Energy Machinery Co.,Ltd identify and prove the technical performance of Litchi and Longan Peeling Machine which is lead in China and in the world. Additionally, we have hold two patents on the machine. After getting rid of the twigs and impurities from lychee fruit (or longan), cleaning the lychee skin with water and process disinfection of lychee fruit. Then simply classifying the fruit lychee according to their different sizes. 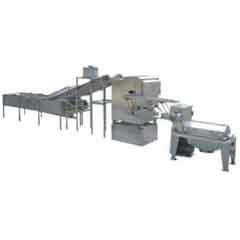 Feed lychee to oriented strip and rotary rubber wheel which is driven by three power rollers. Along with the rotation by rotary rubber wheel, feeding wheel pushes lychee to the surface of oriented strip to cut by knife fixed on knife shelf one by one. 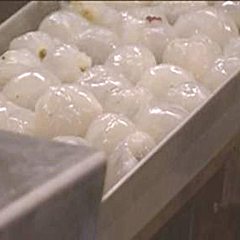 Lychee pump with core would be separated from skin by separating wheel, and falls into vibratory launder. At last, discharging wheel for lychee skins takes the waste skins out of machine. Lychee (litchi, lichee) and Longan Processing Plant includes lychee and longan peeling, core removing and jam making, it is used to peel off the shell, remove the core from the fruits to produce clean Lychee and longan juice, it can be widely used in the downstream processing of lychee and longan juice and fruit wines. 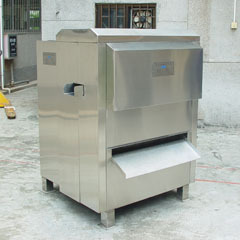 The quality of the finished products is stable and can be up to the Chinese hygienic standard for foods. Lychee and longan peeling, core removing and jam making technology and equipments was a research project which belongs to China Spark Program and transfer of scientific and technology of China. 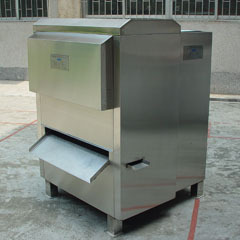 We got two patents for the equipment, in year 2005, the equipment passed the Appraisal of Scientific and Technological achievements, in year 2006, the equipment received Provincial Third Prize of Scientifc and Technological Advancement Award, and Provincial Third Prize of Agricultural Technology Extension Award. 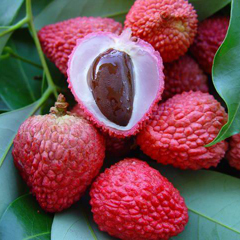 Lychee sugar content rich with added energy to increase the role of nutrition, research shows that lychee take a tonic to build up health such as organizations on the role of the brain, can significantly improve insomnia, forgetfulness,mind tired etc. Lychee is rich in vitamins, micro-blood vessels to promote blood circulation, to prevent the occurrence of freckles, smooth skin.